When it comes to restoring the structural integrity of your plumbing pipes and sealing pinhole leaks, you may be wondering which company and type of pipe lining system would be best for you. Here at Nu Flow of Chicago, we want you to be informed before you choose a pipe lining system – read this review to be informed of which plumbing restoration system will be best for your property. Perma-Liner Industries is an epoxy pipe lining company that offers their own patented pipe lining system. They have been in business since 1991 and own several US and Canadian patents for their technologies. Pipes must be thoroughly cleaned and dried before pipe lining. 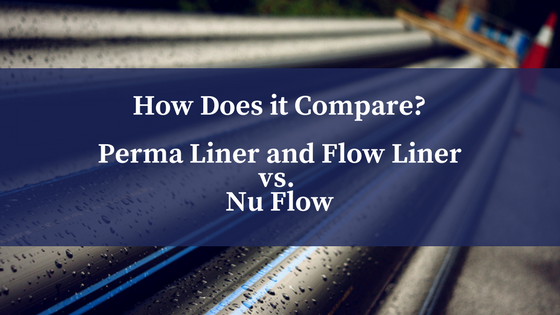 Flow-Liner also specializes in trenchless pipe liners. They’ve been a CIPP trench lining company since 2001, and they use their own patented pipe lining technology to trenchlessly refurbish plumbing pipes. They serve the United States, Canada, Australia, South Africa and Europe. Nu Flow of Chicago has been offering epoxy pipe lining since 2012 and uses Nu Flow Technologies patented pipe restoration materials . We serve Chicago and the surrounding communities and suburbs of Cary, Fox River, Oakwood Hills, Crystal Lake, Lake Forest and every community in-between. Our trenchless pipe lining technologies have been used to reline pipes at Guaranteed Field, formerly US Cellular Field, and condo buildings on East Cedar Street, East Pearson and La Salle. Our patented pipe lining technologies can be used to line all types of plumbing pipes. Here at Nu Flow, we can help you get started on the road to trenchlessly relining your plumbing pipes. Our epoxy pipe lining system is designed to seal pinhole leaks and prevent future corrosion. Plastic, copper, cast iron and brass plumbing pipes can all be lined with our patented systems. To ensure we properly prepare your pipes prior to the installation process, we have a new pan and tilt camera that allows us to see every angle and wall of your plumbing pipes so that we can create a custom pipe lining solution for you. When it comes to cleaning your pipes, we use an environmentally friendly propane-powered jetter, which can be used indoors and is not subject to ozone action days. If your plumbing pipes are severely corroded or it is determined that they would not hold up to the relining process, we can create a custom plan that relines all the pipes that are good candidates for the epoxy pipe lining process, and we can work with our partners at Althoff to replace all the pipes that cannot be lined. 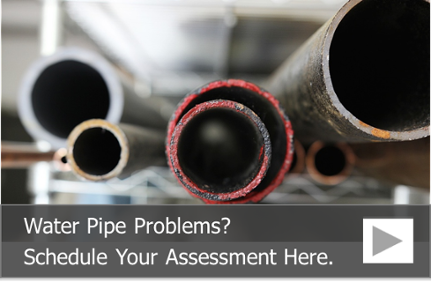 To schedule a building pipe assessment and get an estimate on the costs to install a Nu Flow pipe lining system, call us today at 815-790-9000.